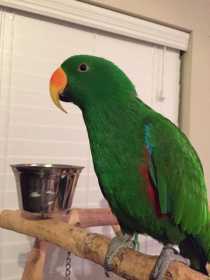 Our male eclectus, Newt, got out of the house yesterday evening. He is a part of our family and we desperately want him back. He was last seen flying towards the corner of Charlestown Colony and Old Tybee at 8:30pm 10/7/201. He may be wary of strangers and may fly away if you attempt to approach him. He is approx. the size of a very small dog, mostly green with a bright orange beak. If he is spotted, please call or text me. If I don't answer the phone, please text me his approx. location.